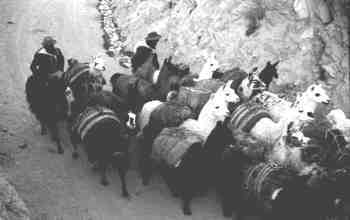 Recently we came across a book with a bunch of black and white negatives, some of which we took many years ago in Peru. 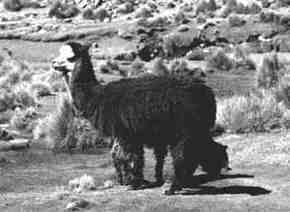 There were even photos of alpacas and llamas and that was long before we knew anything at all about camelids. 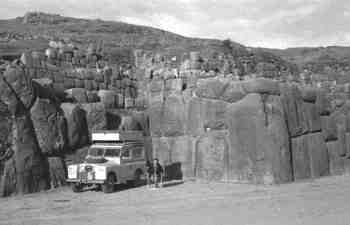 In 1961 we had made a trip to Chile to go skiing and promised to return, so in the spring of 1965 we packed our skis along with a few other things, and headed south in our new Land Rover. To get to Chile by land from North America, you have to travel through Peru which is a most beautiful and interesting country. Entering Peru at the northern border with Ecuador was not quite as simple as one might imagine. There was a dispute between the two countries so the bridge spanning the river was not finished. The only way to cross was to hire one of the rafts used for ferrying produce. 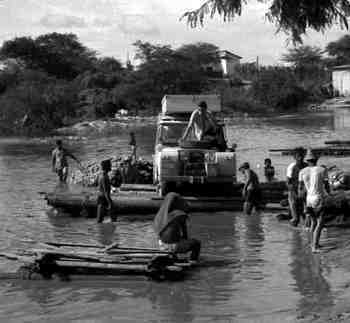 In fact, we needed two rafts tied together as when we got the car on one raft, it promptly bottomed in the mud. 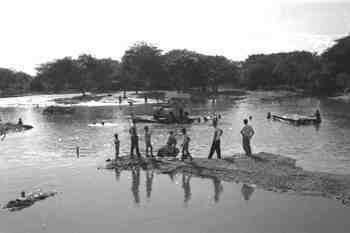 The rafts were propelled across the river by a group of men swimming. Eventually we got across the river safely and then had to proceed through customs. They weren’t used to people entering this way as most people walked across the bamboo scaffolding between the unfinished bridge piers. They only wanted to know how many suitcases we had. Our two suitcases were in the box on top and I had to climb up and retrieve them. It was sort of difficult to explain what ski clothes were as we were only a few miles south of the equator. The customs guards didn’t even look in the car. That wasn’t their job, they were supposed to look in suitcases. We found out that somewhere in the next town there was a building where the paperwork for the car would be taken care of. 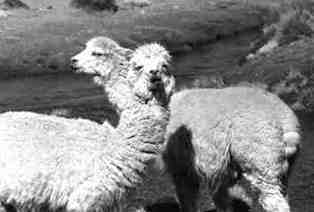 Up in the mountains of Peru, it is not unusual to see herds of alpacas. 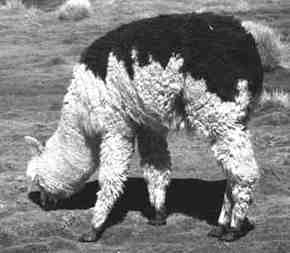 We just assumed that they were llamas, not knowing the difference until years later. We were fascinated by these unusual animals and would stop and take photos when we could. 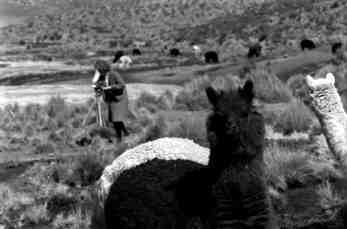 Here, Jane is trying to take some 16mm film taken of them while the alpacas are more interested in what we are doing. We even took a photo of a llama pot in the museum in Lima. Oops. The roads in Peru are a little rough in places. At least we made it through the river in the background before we had this little problem where the rear spring was dragging on the ground. The roads in this area are not well-travelled, we had only seen one vehicle all day. Jacking up the vehicle was a little tiring as the altitude was around 12,000 feet. Luckily it was only 95 miles to the nearest town. 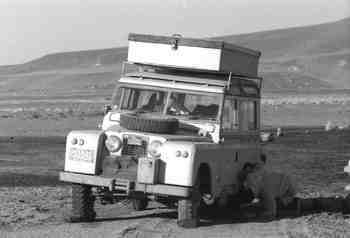 We managed to get the Land Rover repaired and camped at Sasahauman near Cuzco. The Incan stonework towered over us, some of the boulders were immense. 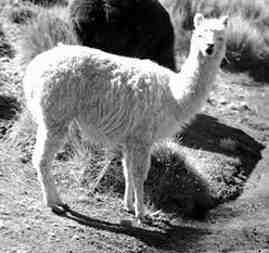 In the morning we saw a woman walking by with her llamas. 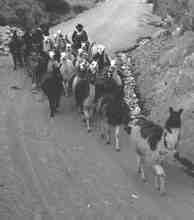 As we travelled through the mountains we were always fascinated when we would see someone herding their pack llamas through the altiplano. 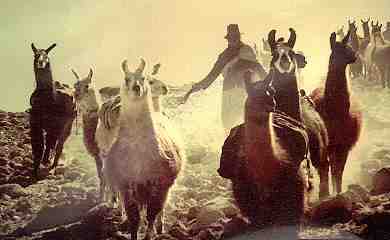 along behind the animals and the llamas seem to know where to go.